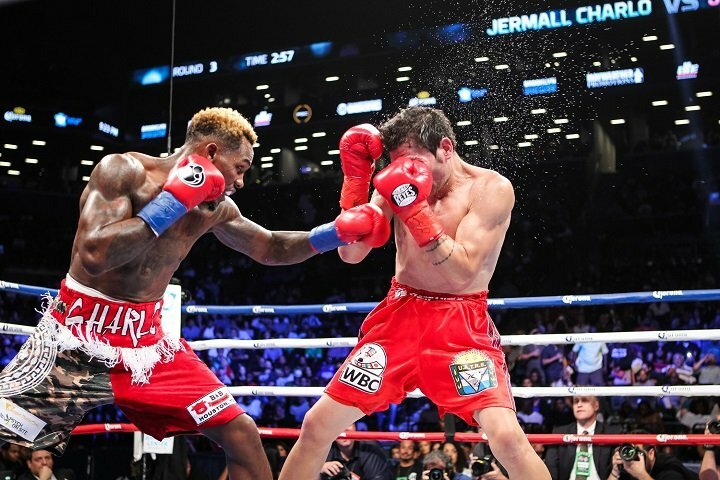 #2 WBC middleweight contender Jermall Charlo (26-0, 20 KOs) took advantage of a badly injured Jorge Sebastian Heiland (29-5-2, 16 KOs) to knock him down 2 times and stop him in the 4th round on Saturday night to become the mandatory challenger to WBC champion Gennady “GGG” Golovkin at the Barclays Center in Brooklyn, New York. Heiland had a left leg injury that he started the fight with. The fight arguably should have been stopped right away once it was clear that Heiland’s left leg was injured. Charlo knocked Heiland down in the 2nd and 4th rounds. The finisher came from a left hook from Charlo. To be honest, Charlo could have hit Heiland with anything by the 4th and he would have knocked him down. Heiland’s left knee was not strong enough to keep him on his feet. Referee Benji Esteves called a halt to the fight at 2:13 of the 4th. In round 2, Charlo caught Heiland with a left to the head that put him down. Heiland was dragging his left leg while fighting. He didn’t have the legs to stay on his feet when he was caught by Charlo’s left hook. He was off balance. Charlo tried to finish Heiland off after he got back to his feet, but he missed badly on at least a dozen punches. Heiland was kind of making Charlo look bad at the time. It didn’t matter though. Charlo was going to be able to keep bombarding the injured Heiland all night long. As it turns out, the ending of the massacre came just 2 rounds later when Charlo finished off Heiland with a left hook to the head in the 4th. Charlo won’t get a chance to fight Saul “Canelo” Alvarez if he defeats Golovkin in their fight on September 16, because Canelo has already said he doesn’t want to fight for the WBC title. The belt will go vacant if Canelo wins. Whether Canelo is making that decision to avoid Charlo or if he’s doing it because of him not having a good relationship with the World Boxing Council is the big question. It might not matter anyway, as Golovkin is the favorite and he’ll likely be too big and strong for the finesse fighter Canelo, who isn’t a big puncher at middleweight. A very heavy looking nearly 300 pound Jarrell “Big Baby” Miller (19-1, 17 KOs) stopped Gerald Washington (18-2-1, 12 Kos) in the 8h round. The fight was stopped by Washington’s corner after he’d taken some heavy punishment in the 8th. Both guys were buzzed during the fight. Miller was not the fighter that he’d been a year ago when he stopped journeyman Fred Kassi in 3 rounds. Miller was not nearly as impressive against Washington, who was a big upgrade from Kassi. The performance from Miller showed that’s not ready to take on the best in the heavyweight division. If Miller had been fighting Anthony Joshua, Deontay Wilder or Joseph Parker, he would have lost. That’s just telling it like it is. Miller doesn’t hit as hard as some boxing fans think he does. He needs to lose about 40 pounds to try and get down to 260. 300 pounds is way too much for Jarrell Miller to be weighing in fighting the better opposition. If Miller waddled into the ring at 300 lbs. tonight against Wilder or Joshua, he would have been flattened. Washington loses once again. He was knocked out by Deontay Wilder earlier this year in 5 rounds last February. Tonight, Washington made it a little further in going 8 rounds with “Big Baby” Miller, but he clearly doesn’t have the chin to fight at a high level. Washington needs to use more clinching and focus on patterning his fighting style more after Wladimir Klitschko if he wants to succeed.